First thing you should do is connect a set of ac gauges up to the system and see what kind of static pressure it has. Would be kind waste of time to chase electrical issues if you have a low charge. Thanks, will do, what should the static pressure be for this truck? The static pressure will vary with outside temp but anything over 50PSI will engage the compressor. 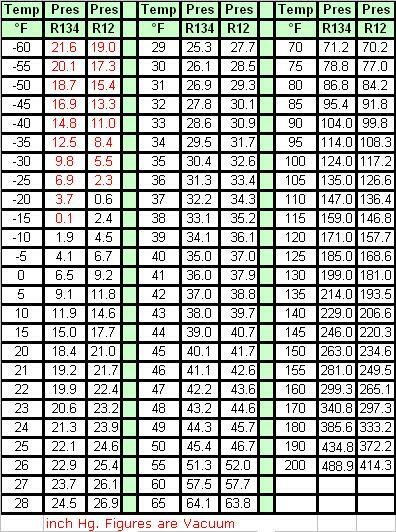 Static Pressure chart. Note that this is what refrigerant pressure will be (system off) just like checking tire pressure. It's pretty exact. Engine heat will change the under hood temp. That's a whole lot more information than you'll need. All we're trying to find out here is if you have minimum pressure for the compressor to engage. OK, so, hooked up ac gauges - 105L, 100H with vehicle running for 30 minutes, turned ac on high, no change and compressor did not engage. OK, so you have sufficient pressure for the compressor to engage initially. That means your issue is electrical and you are going to have to follow a wiring diagram to fine the cause. Hello, thanks, I will work thru these. If I have to evacuate the system, do you recommend re-charging with an added dye? You have enough pressure as HT said to trigger compressor upon request. That doesn't tell you more yet just that there's some refrigerant in the system and should kick on even if instantly kicked back off. Check with LED test light if plug to clutch coil has power. If so BE CAREFUL but tap on head of clutch easy with like a small rubber hammer or wood as it might engage. Beware if it does where you tap is going to spin at engine speed. All caution or don't do that. Try just key to run, engine off and do that again if any chance tapping it would make item a projectile. See if it snaps to. One test you can do to get some direction is to go into the relay box and put your finger on the AC relay. 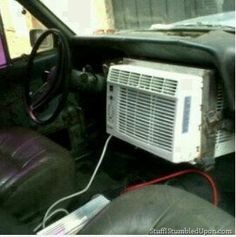 Have someone turn the AC on and off with the engine running. You can also remove the relay and touch it on and off in the relay cavity and feel it click on and off if you don't have a helper. You should feel the relay clicking. The clicking will tell you if the PCM is getting an ac request from the control panel and if the pressure switches are good. That would eliminate half the system. If the relay doesn't click, that means you have to look at PCM's AC system inputs and the PCM's relay control output circuit, make sure the relay itself is good, and make sure you have the powers on terminals 1 and 3 in the relay cavity with the key on. If the relay does click, that means you need to find out if power is getting to the ac clutch. Either way you go, it will lead you to the problem. I just find using the relay as my starting point because it is easily accessible and checks are easily made to determine which half of the system to go to next. Of course, after testing everything but the mini fuse, I check that and it was blown.. The 10amp mini fuse, which also operates the running lights (which work with a new fuse) ends up blowing when I turn the ac switch in the truck on, therefore the running lights go out as well. You need to find the short in this part of the circuit then. Inspect the wiring harness really good. Look for any wiring or parts of the harness that are rubbing on brackets or metal parts. You can also unplug the compressor and see if the fuse blows to see if you have a field coil shorted out. A shorted diode is another possibility. Please help with schematic, not very good with them. I used youtube to find other tests. Where is this part of the system? Between the on/off switch and fuse?, between the fuse and relay, or between the pressure switch and compressor, or elsewhere? You can see from the diagram that power from that fuse goes to the relay as clutch supply power. The relay completes the connection to the clutch coil so either the compressor clutch is shorted, the relay is shorted or the wiring in between is shorted. The clutch is the most likely suspect so just unplug it and see if the fuse still blows when you turn the system on. 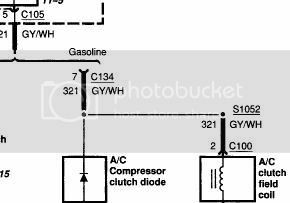 If disconnecting clutch doesn't blow the fuse one more check is ohms at those terminals. Not below 2 or above 5 and want about 3.5 or so. You mentioned continuity but not just how tested or whether plug end or coil end? If you unplug the compressor and it stops blowing the fuse........ you're done .......... Replace the compressor. Roll dice if so. $525 whole new or $135 complete coil and clutch assembly.........Do the test first of course! A new compressor with clutch for that truck can be bought for under $200 in some cases and commonly below $250. That's a great idea. I have a bunch of squirrels in the back yard I can train to power it. Surprise, the fuse blew with the compressor unplugged. Could it be the on/off switch on the dashboard? No. The short is in the wiring between the relay and the connector that plugs into the compressor. It could also be that diode could have shorted. You need to inspect the wiring. Inspect those wiring harnesses. Look for anything that doesn't look right. I haven't seen a relay short out when energized, but anything is possible. You could swap another relay in the box to see if it does the same thing. Where is the diode located? Will check the whole harness for breaks..